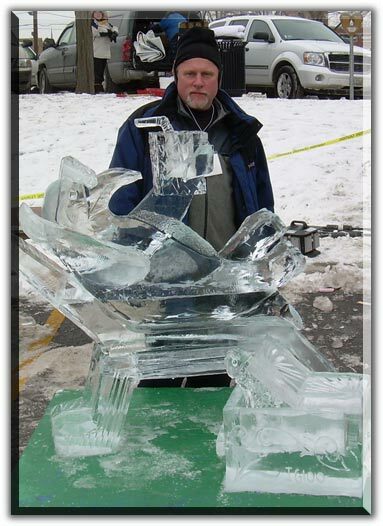 Congratulations to John Russell for ten years of great service and excellence as an ice carver at Ice Visions! Congratulations to Kate Saitta for 15 years of superior service and for holding the office together. Kate is the friendly voice on the phone. Feel free to call Kate with any questions you have. 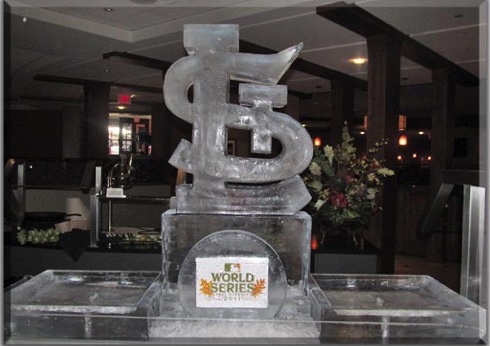 The carvers at Ice Visions didn't get much sleep during the 2011 World Series and Playoffs. 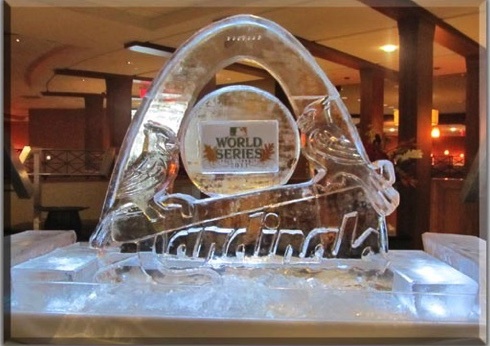 They carved over 100 blocks of ice for the St. Louis Cardinals! Ice Visions got a thumbs up from Bill DeWitt for "the beautiful carvings." 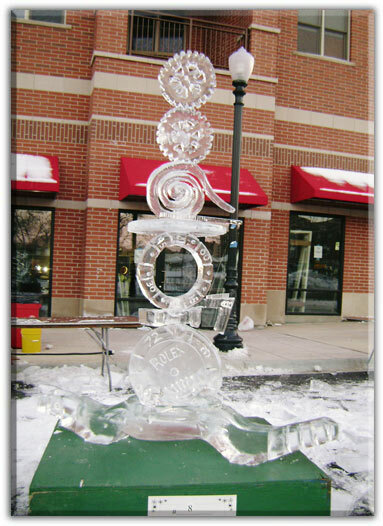 Ice Visions Sculptures were featured in the 1st and 2nd Place booths of the Zoofari Winners! David Van Camp Featured in January 2009 issue of St. Louis Magazine! David Van Camp started out with a knife but ended up with a chain saw. At one time, the European-trained chef spent more time chopping onions than ice. But after competing in several invitation-only ice-carving competitions around the world, he made the leap to full-time ice carver in 1992. “I told these chefs, ‘Put down your picks, and I’ll take care of it,’” he says. 1. Every sculpture begins with a block of ice. Eleven ice-making machines slowly freeze purified water into 300-pound cubes of ice. Why does he choose ice over a traditional medium? “I like the crystal quality,” he says. 2. A new design starts with a sketch. Van Camp finds a picture of an object, then scribbles down he shape, figuring out the dimensions as he goes. “The trickiest part is getting idea out of a block of ice,” he says. 3. Once he’s happy with the design, Van Camp traces the shape’s outlines with a pick. “The design dictates how we’ll carve it,” he says. He often uses a chain saw to carve out the tough shape before refining with with a drill and Japanese hand tools. 4. Ice Visions creates more than 2,000 sculptures per year, with roughly half destined for wedding receptions. In mid-October, the company made 15 deliveries during a single weekend night. published by the St. Louis Jewish Light. Warm feelings, cold medium Dave Van Camp of Ice Visions carves out a sculpture featuring two interlinked hearts for a local wedding. Ice Visions can bring an ice creation to life. Couples looking for a "chill" wedding have the perfect decor by way of Mother Nature: ice sculptures. 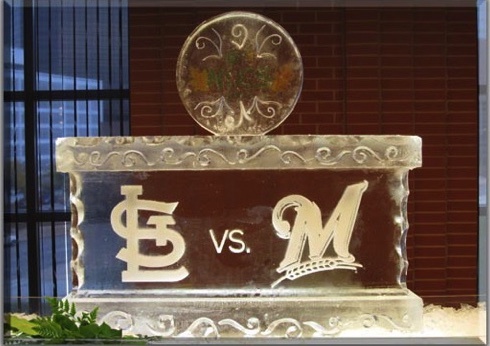 St. Louis ice sculptors can shape frozen water into many forms to fit any wedding. 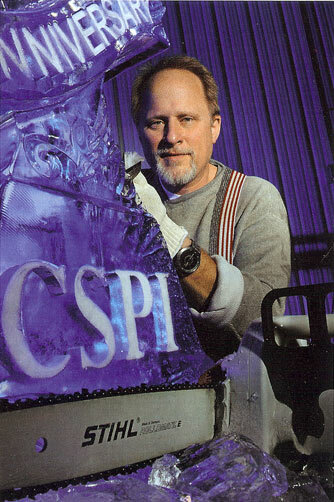 David Van Camp, owner of Ice Visions, has created ice sculptures for 500 weddings each year since 1992. 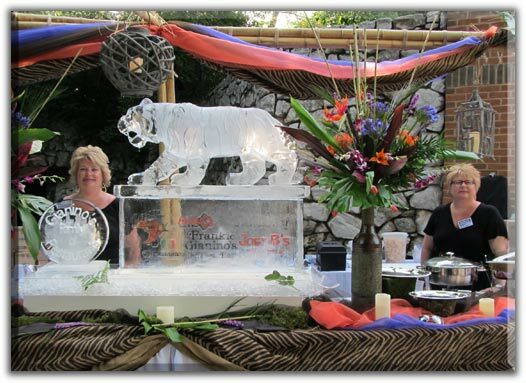 “An ice sculpture enhances the whole reception room. The piece can fit the ambiance of the event and adds so much to the whole feeling in the room." 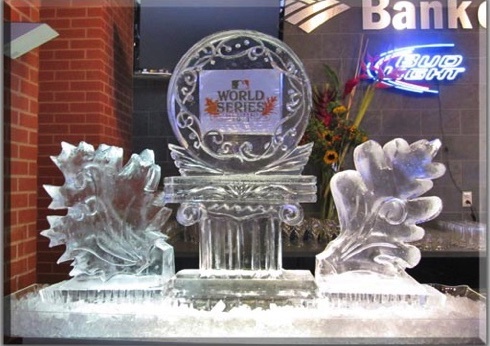 Depending on the temperature of the room, ice sculptures typically last from five-to-seven hours. 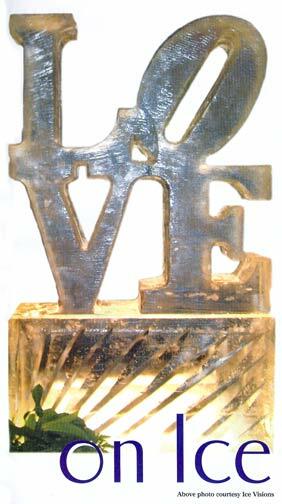 Van Camp has also noticed that his customers prefer unique sculptures. "We can do double hearts, swans, a bride and a groom, and monograms, but most people prefer custom work." 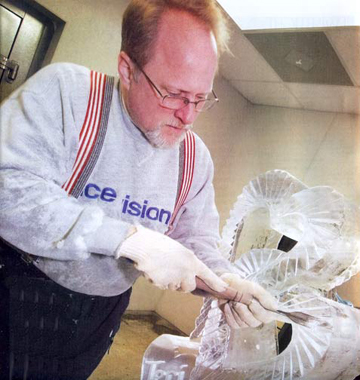 Using a computer numerical control machine, Van Camp uses a computerized 3-D sculpture machine to produce the frozen art. 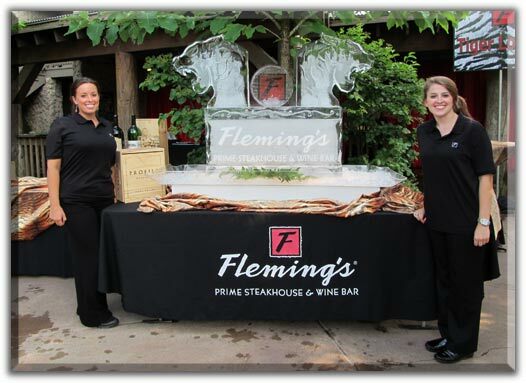 Ice sculpture offerings include more than just buffet or gift table centerpieces. Van Camp can create small, matching sculptures to be placed on each guest table. 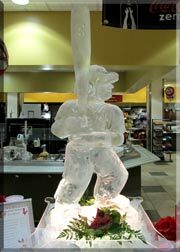 He also forms full sized ice bars out of thousands of pounds of ice. Photos of the wedding couple could be frozen and visible within the bar. 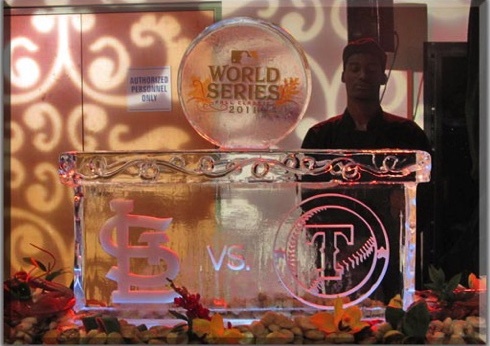 Another popular ice exhibit is an ice luge, which dispenses beverages. Van Camp uses light to further decorate his sculptures. "Part of the whole package is to illuminate the sculpture," he explains. He can also freeze objects into the sculptures, such as bottles of liquor. Brides and grooms searching for their ideal ice sculpture can visit ice sculpting events held during the wintertime in St. Louis. The University City Loop holds an Ice Carnival each January. 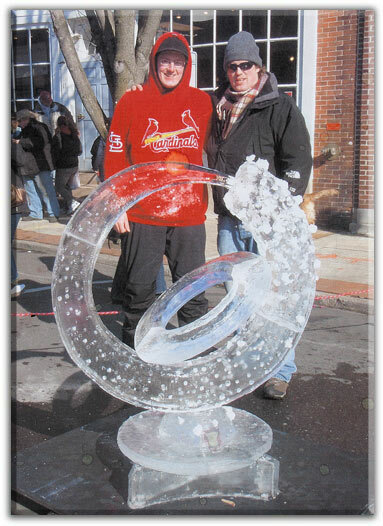 The Fete de Glace ice festival and carving competition is held annually during January in downtown St. Charles. Van Camp also recognizes the benefits of having ice sculptures at a wedding. "People don't realize how much an ice sculpture can fulfill an evening." The possibilities are endless. Congratulations to Aaric Kendell, Ice Visions Alumni, for winning First Place at the Ice Carving Expo at the Winter Olympics in Vancouver! 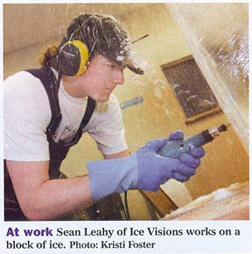 Ice Visions Sculptor, Sean Leahy wins first place with "Incrementum" ice sculpture. The St. Charles, Missouri competition was held on the January 29, 2005. The team carvers from Ice Visions made a prominent display of their talent. Dave Van Camp and Johnathan Russell took First Place in the 1500 pound, five block display with Dave's design of the Mother Goose "Cow over the Moon." A real crowd pleaser. Dave also received 2nd place in the single block Master Carving category earlier the same day with his "Ouch That Hurt's " carving. Sean Leahy made a fantastic showing as his first competition in the Carver Class with 2nd place for his "Ice Breaker" break dancer design. John was a close 4th place with his beautiful Orchid, "Ice Blossom" carving. Great work guys! In February Ice Visions produced the first annual Ice Display and competition in downtown St Louis, at Laclede's Landing. It was a fun and successful event. We had 10 of the best area ice carvers competing for trophies and cash prizes while showing their talents to the hundreds of spectators. Ice Visions displayed several sculptures along 1st and 2nd streets and created a "101.1 the River" logo live on stage by David Van Camp. The event was created in cooperation with the Laclede's Landing Merchants association along with the hard work of the Ice Visions associates. 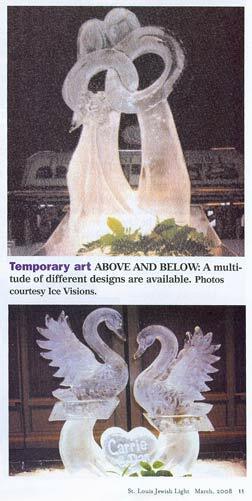 David Van Camp, owner and sculptor of Ice Visions, was featured in the St. Louis Post Dispatch in September, 2004. The article had a colorful picture of Dave carving in his shop and gave a wonderful overview of Ice Visions. The article was written by Shera Dalin. Thank you Shera for the super publicity.